Ameriware Professional commercial grade, American-made 6 Qt. Covered 12" Chicken Fryer. 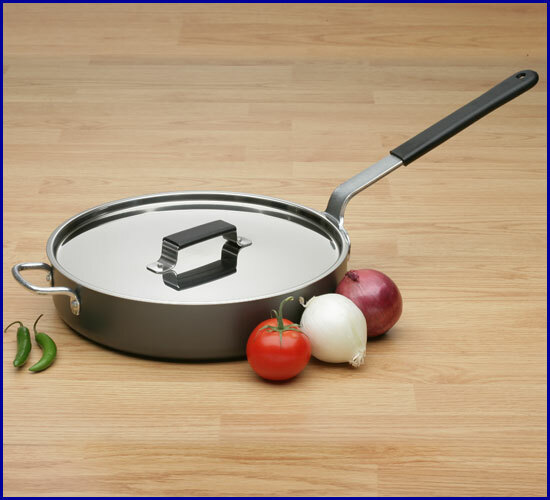 This cooking vessel is great for heavy-duty cooking such as frying and baking in the oven. NSF approved. Completely nonstick inside and out.Features the Pro Series Plus Ti-2 nonstick system. This revolutionary new 3-layer system is internally reinforced with ceramic and titanium. It is the most durable non-stick system available today. It is tougher than any other non-stick system period! Approved for use with metal utensils. Cooks without fats, oils, or grease. Burned on messes wipe clean with just a paper towel! Tri-riveted, nickel-plated steel handles are completely ovenproof and dishwasher safe. You are not just getting stovetop cookware; it is bake ware as well. Comes with a full 25 year warranty. Great for chicken, lasagna, casseroles, 7-bone roasts, pot roasts and can be used on the barbeque too. Only $239.99. Comes with completely removable cool grip for handle and cover handle strap, a $15.00 value, free with your purchase today.